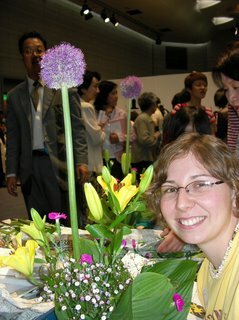 Today I had the chance to go to an Ikebana Festival in Osaka. In English "Ikebana" would be translated as "flower arranging". I know it doesn't sound very interesting. I mean who takes their whole Sunday afternoon to go to a "flower arranging festival"? Ikebana, however, is actually very interesting and fun. Each of us had our own mat (to stick the flowers into), scissors (to cut the flowers-obviously) and a bunch of flowers to use in our arrangement. Each pattern, each flower, each color has a meaning. It is a very traditional Japanese art. Unfortunately, I never actually caught the meaning of our arrangement. I was too busy concentrating on how to get my arrangement to look like the model and noticing how the girl across from me (who was from Korea) was doing a significantly better job than I was. Actually, a quick glance around the table told me that everyone was doing a better job than me. Oh well, at least the Japanese are encouraging and kept telling me what a good job I was doing. Liz and I even got interviewed by a reporter from a Japanese newspaper. Maybe I'll be famous for being the foriegner who "just kept trying, no matter how good it looked." Well, it was a fun day and another Japanese cultural experience. I heard it was someone's birthday today. Don't suppose you know who that is do you?